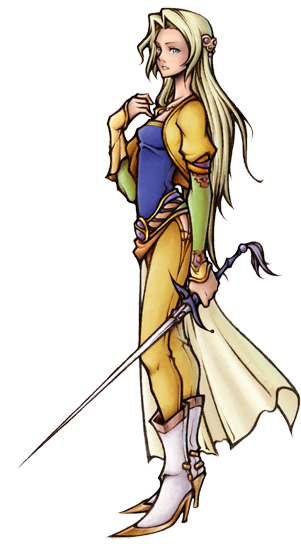 Celes is one of the few Final Fantasy protagonists, chosen for the first round of FFTWFF which are counting to the more important protagonists of the game(s) they were featured. 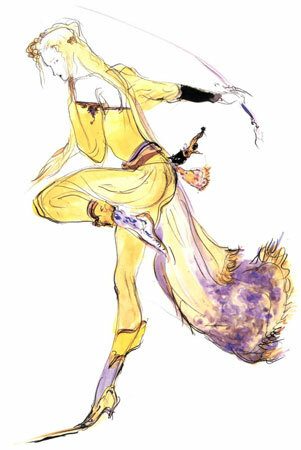 The artists who drew her for our project did not just do an amazing job with their illustrations but also described Celes Chere and her role in Final Fantasy VI very well already…there is nothing important i could add here, so scroll down now please! To see the artworks in their full size, just click on them! Why did you choose Celes? I always loved the Final Fantasy series, so I was excited to see this project. But I was kind of late in choosing, so a lot of character was already taken when I decided to join. Out of all the ones that were left, I found Celes the most interesting in both her character design and character; and I felt that it would be awesome to draw her with a little spice of my art style. 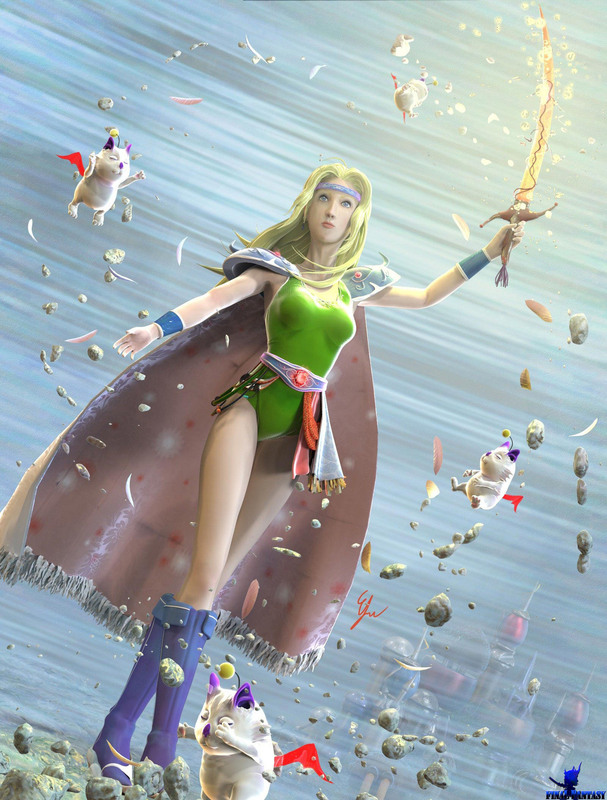 What do you like about her and about FFVI? 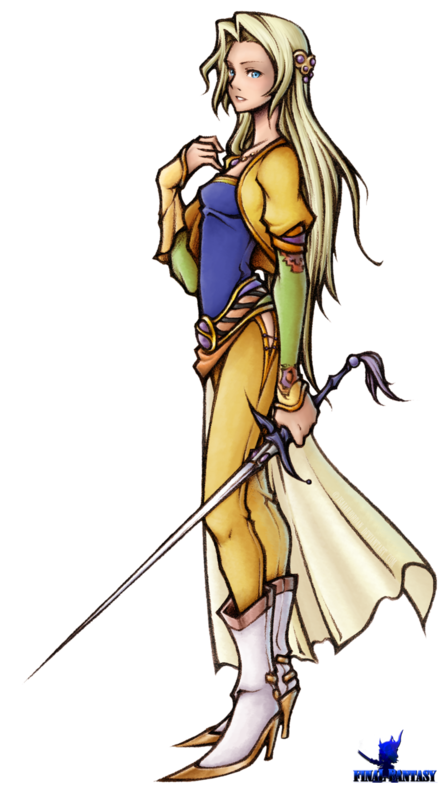 She actually gave me the biggest impression in FFVI, even more then the two main characters. Her strong personality really left an impression on me. What tool did you use for the artwork? Besides the few reference books that I used, I guess all I used was my beloved Intuos 4, Sai Painttool and my comp. As a rune knight, I try to make her pose as she is casting magic with her sword. Her sword is something I did without any reference so it’s probably doesn’t resemble anything in the game. The main focus is probably the dramatic movement of her hair; and the light the shine from the sword behind her. In terms of art composition, I try to contrast the blue lite background from her yellow clothing. AlNiCo-ism is one of the few Asian (Hong Kong in this case) artists who were participating in Game-Art-HQ art projects yet, and i had a feeling back in january 2013 already that this artist would be part of our Final Fantasy Tribute when i saw the Aerith Gainsborough artwork and invited this artist to our dA group! Efraimrdz is a professional Mexican artist and on board of many GA-HQ art collaborations since the MegaMan 25th Anniversary Tribute in December 2012. He created some of the most detailed artworks ever made for the oldschool Zelda characters for Link’s Blacklist and continues to impress everyone with giant compositions of Castlevania Characters and now Final Fantasy as well! Celes is an great character she has an amazing development and concept behind her. She’s the opposite of Terra, in meaning of skills they’re similar but Celes knows who she is and does not like the path she’s going through. She is a rune knight meaning that she is a mighty swordswoman and a powerful mage. This concept of a magik knight (red mage) is one of my favorites of the series. Every character from this game is my favorite but Celes has something that reminds me of the good ol’ times playing this game. It was the first Final Fantasy game I played, I’m still amazed of the characters development, the game itself wraps you in every moment and plot twist. Her is a moving story as an ex-general of the enemy army she starts out of place but soon she finds herself fighting with her friends to protect the little good that’s left on the world. I employ different software for the making of art pieces, depending on the situation; for this particular one the modeling was done in blender. I based her Snes attire and concept on the art style of Yoshitaka Amano, there’s a lot of textures and patterns, her cape has a silk pattern on both sides and used diferent materials for every part of her belt and armor; you can see some small details even on her bracelets. Celes is fighting against an unknown enemy and she´s using her runic ability to protect herself and her moogle friends against the enemy spells. The light shines her runic sword as if it were about to absorb some kind of magic and helps placing your view in her face and to help in the picture’s movement I used the debris it’s power is lifting. In the bacground through the wind you can see the steam powered town of narshe. I just wanted to. I’ve drawn Celes before, but I just really wanted to drawn her again for some reason. It was like, my creative juices started flowing in my head, and I just let it loose when drawing Celese. I don’t know much about Celes or FFVI, cause I haven’t played it yet. Wish I could though. I sketched her in pencil first, scanned it, then colored her in Photoshop. I wanted to draw her in a Dissidia format. Y’know, what her character artwork would look like if she was added to the Dissidia roster. Is there something else you want to tell the visitors of the Final Fantasy Art Tribute on Game Art HQ? Its a gallery filled with artwork from Final Fantasy fans, including myself from all over. Showing their love for the series and how it became a part of them growing up. Isaiah Amancio is a professional Canadian artist and a giant fan of Square Enix and of course the Final Fantasy universe! His Celes Chere is the first illustration by him made for a Game-Art-HQ Project. The Final Fantasy “Those who fight further” Art Project is a tribute to the protagonists of the Final Fantasy series and an ongoing project with thirty more artworks for ten characters every 3-4 months, the next update will be released in October-November 2013! Beside the only FFVI characters drawn so far are Sabin and Terra, click on the logo below to return to the main gallery of our new project!